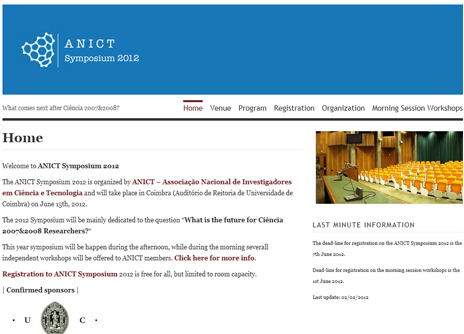 This year ANICT Symposium will take place in Coimbra (Auditório de Reitoria de Universidade de Coimbra) on June 15th, 2012. The 2012 Symposium will be mainly dedicated to the question “What is the future for Ciência 2007&2008 Researchers?“. This year symposium will be happen during the afternoon, while during the morning severall independent workshops will be offered to ANICT members. Click here for more info. SMEs, coaches and investors are invited to attend the *ICT Finance MarketPlace**Investment Forum*brokerage event in Lisbon, Portugal on 26th March 2012. There is no charge for this event which will be held together with the annual **Tech Media Europe 2012* *. *ICT Finance MarketPlace* is an EU-funded initiative to improve access to finance for SMEs engaged in ICT innovation and to provide entrepreneurs with opportunities to showcase their business in front of investors. **Tech Media Europe* *is also a brokerage event aimed at identifying promising tech start-ups from across Europe. It attracts top European venture capital, corporate, private and other investors. In 2011, these included *Vodafone Ventures, Alcatel-Lucent, 360 Partners* and many others. The event’s top 10 graded presenters will qualify for the */European Venture Summit/* and win a chance to reach the final of the *European Venture Contest *. Extensive, high-profile networking opportunitieswill be available as a result of strong, active support fromthe Portuguese Secretary of State for Entrepreneurship, Competitiveness and Innovation, from *ICT Finance MarketPlace* and from the EuropeanUnion. We are also offering the opportunity to attend a *Venture Academy* run by *ICT Finance MarketPlace* on 25th March in the same location. This is a coaching event where experienced coaches from relevant industry areas will provide participants with one-on-one practical help to develop their pitching skills towards potential investors and prepare them to present at **Tech Media Europe* *. * Free *networking* with investors, entrepreneurs and other key players at the event. * *High visibility*at the event and we will publish your company profile in the conference binder and on our website where it will be seen by in investors. There is no charge for participation in either the *Venture Academy***or the *Investment Forum* of *ICT Finance MarketPlace* which are funded by the European Union’s 7th FrameworkProgrammefor Research and Technological Development. However, places are strictly limited and awarded on a competitive basis. Therefore, please apply before *13 Feb 2012*. If you have any questions please do not hesitate to contact me at TESEO (molony@teseo.be , Tel. +32-486-563566). Join our LinkedIn Group !